As Taub Center Executive Director Professor Dan Ben-David shows in the Taub Center’s State of the Nation Report 2009, Israel’s living standards are not only lower than those of the G7 countries (the seven leading economies of the world), they have also been rising at a slower rate over the past decades, leaving Israel farther and farther behind the leading countries. 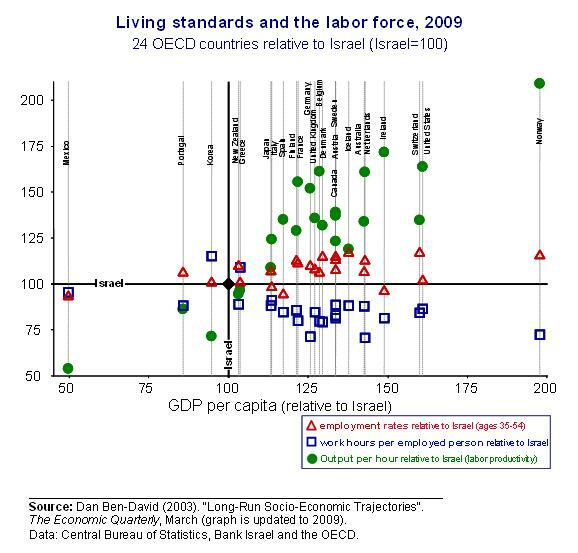 The share of Israelis who are employed is below all but four of the other OECD countries (see red triangles graph). On the other hand, Israelis who work tend to put in more hours of work each week than do workers in all but two of the other countries, regardless of whether those countries are wealthier or poorer than Israel (the blue squares on the graph). The primary factor determining standards of living in a country is productivity. One measure of productivity is labor productivity (defined as GDP per hour worked). The strong link between productivity and standards of living that exists across countries – and is visually evident in the figure (by the green circles) – is not a coincidence. The more productive a worker is, the more he or she can be compensated and the higher the standard of living. This is a major reason why productivity is lower in the three OECD countries with lower living standards than Israel’s and why it is increasingly higher in the wealthier OECD countries. This figure shows an interesting relationship that appears to hold across modern Western economies: in countries in which a greater share of the population is employed, and each person – on average – is more productive, then employed individuals tend to work fewer hours during the week and the country’s average living standards is nonetheless higher. 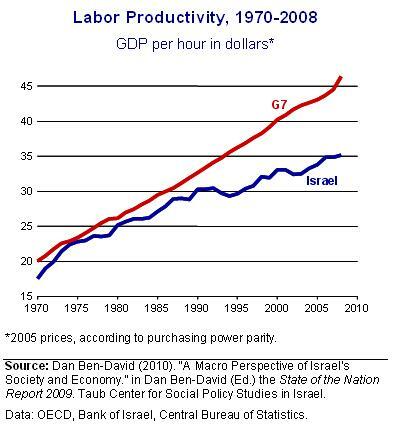 Israel’s productivity picture is one of a steadily increasing gap that has developed between itself and the G7 countries (the second figure). The relatively slower productivity growth since the 1970s has translated into relatively slower economic growth, with Israel’s standard of living falling farther and farther behind the G7 countries. The irony is, as Dan Ben-David shows in the Taub Center’s State of the Nation Report, that Israel invests extensively in research and development and, in certain areas, its creativity and innovation surpass those of the West’s leading economies. But while some sectors of Israel’s economy are cutting edge, the overall human capital and physical infrastructures have not kept pace. Increasingly congested roads (see January 2011 Bulletin) lead to higher transport costs and consequently lower productivity. Low levels of education and insufficient skills among large and growing segments of Israeli society reduce their ability to produce – and incomes tend to reflect this. As a result, even when there are some areas in which the Israeli economy can successfully compete on a global scale, the heavy weight of the unskilled population enters the calculations of the national average. It turns out that the more advanced sectors of Israel’s economy are unable, on their own, to raise the country’s average standard of living to the highest Western levels. On the contrary. The large unskilled population pulls the national growth path downwards, so it is no coincidence that Israel’s long-run economic growth path has been lower and flatter than those of the advanced Western economies. The employment picture in Israel is a problematic one, particularly for men. Though Israeli unemployment rates are below the OECD average, they only measure the share of individuals who cannot find employment out of those looking for work. However, there is a very large segment of the Israeli population that is not even looking for work. Thus, the more relevant measure is non-employment – which includes the unemployed, those who are not participating in the labor force and those not looking for work. As highlighted in the June 2010 issue of the Bulletin, the share of non-employed Israelis out of the prime-working age (35-54 year old) male population is more than half as much more than it is in the West: 19 percent were not employed in Israel in 2008, versus 12 percent non-employment in the OECD. Two groups stand out in particular in this regard, Arab Israeli and haredi (or ultra-Orthodox) men. In 2008, 27 percent of prime working age Arab Israeli men were not employed (double the share in 1979) while 65 percent of haredi men of the same age were not employed (over three times the share of non-employed haredi men in 1979). It is important to note that even among non-haredi Jewish men, who are still the large majority in Israel, the share of non-employed (15 percent) is one-quarter more than the OECD average of 12 percent. Three decades ago, in 1979, the share of non-employment among non-haredi Jewish Israeli men was the same as the OECD average. This means that there has been a deterioration in relative male employment rates across the board in Israel. The marked increase in male non-employment has coincided with a multi-decade decline in the employment of less-educated and unskilled Israelis and steady multi-decade increases in welfare benefits per capita. The result is that relatively fewer shoulders bear the weight of Israel’s economy and must work more hours to do so. While the Israelis who work do so for more hours a week than is common in the West, the trend among Israeli men is towards fewer weekly work hours today than a decade ago (third figure). In his study that will appear in the upcomingState of the Nation Report, Ayal Kimhi finds that non-haredi Jewish men, who represent the largest group of males in Israel, worked an average of 49.3 hours a week in 1998. By 2009, this fell by more than three percent, to 47.6 hours. 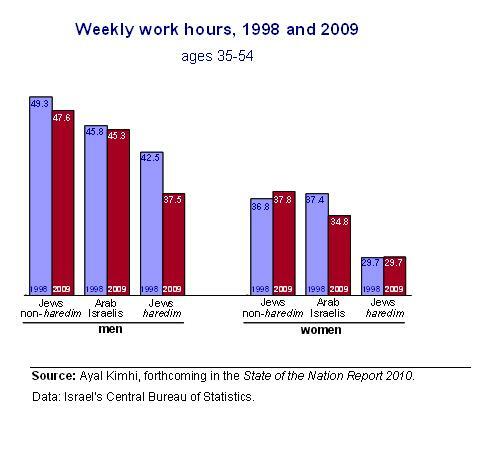 Weekly work hours among Arab Israeli men were below those of the non-haredi Jewish men in 1998 and in 2009, falling by one percent over this period, from 45.8 hours a week in 1998 to 45.3 hours in 2009. The employment situation among haredi men is considerably different than for the other population groups. Not only are their rates of employment very low, the Kimhi study shows those who work do so for considerably fewer hours per week than the other groups, seven percent less than Arab Israelis and 14 percent below non-haredi Jews in 1998. In addition, the drop in haredi hours of work per week, of five hours – a 12 percent fall – was sharpest among all groups. As a result, even among those relatively few haredi men who are employed, they worked fewer hours a week in the past than the other groups, and they reduced their weekly work load by far more over the past decade. Hence, not only has there been a widening gap in employment rates between haredim and other men, this relative deterioration in employment is also evident in a large and increasing gap in hours worked. As a result of the diverging work norms among haredim and others, it is not surprising that an increasing share of haredi families are falling below the poverty line. The issue of haredim and work is becoming increasingly problematical as their share in the population rapidly increases. Ultra-Orthodox children represent one-fifth of all primary school pupils today, with an increase in enrollment of 51 percent over the past decade alone – compared to a decline of three percent during this same decade in the State non-religious schools (whose share fell to just 39 percent of the total in 2008). As this major segment of the population rapidly increases, their ability and willingness to be engaged in a modern competitive society has become a major issue that needs to be reckoned with by Israeli society and its leadership. When this is coupled with the fact that the haredim refuse to allow their children to study core curriculum subjects at levels that could facilitate their integration into a modern and competitive economy, the implications for future labor productivity growth that would enable higher compensation are not encouraging. The combined result of problematic employment habits and poor education is that there are increasing pressures for raising overall government assistance to these families, with all of the attendant tax and welfare implications that this has for the rest of Israeli society. In light of the fact that the haredi population is increasing at a faster pace than all other segments of Israel’s population, what happens to this group is beginning to have wider repercussions on the average standards of living for Israeli society as a whole.